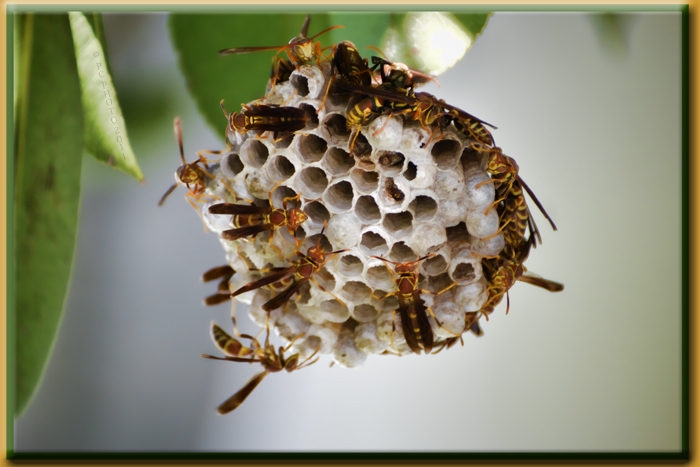 Quite a battle was waged under our carport this summer because the sun is too intense for our potted Foxtail Palm tree, it is also too intense for insects and a group of wasps / bees built and rebuilt their nest on the underside of the palm and they formed a UNION to protect the nest. They were bothersome whenever someone walked too close to the tree to the point of stinging a visitor. We finally won the battle to remove their nest but they won the war because they built another just around the corner of the house under a leaf of our Little Gem Magnolia. DIY: Topaz Labs has just released Adjust 5 with loads of new presets and options. The upgrade for current Adjust users is free! New users can get a 30 trial for free! Great editing tools and support from Topaz.com! Free Webinars and Videos on YouTube. Sign up for an intro webinaand you could win a FREE copy of the new Adjust™ 5!